Whether it’s the latest holiday snap destined for the fridge, pictures for a school project, or clippings for a mood board, this value photo paper will deliver Epson quality every time. This photo paper has been specially developed to work with Epson's range of inks to deliver the best possible quality. It can also work with any brand of rear feed inkjet printer. 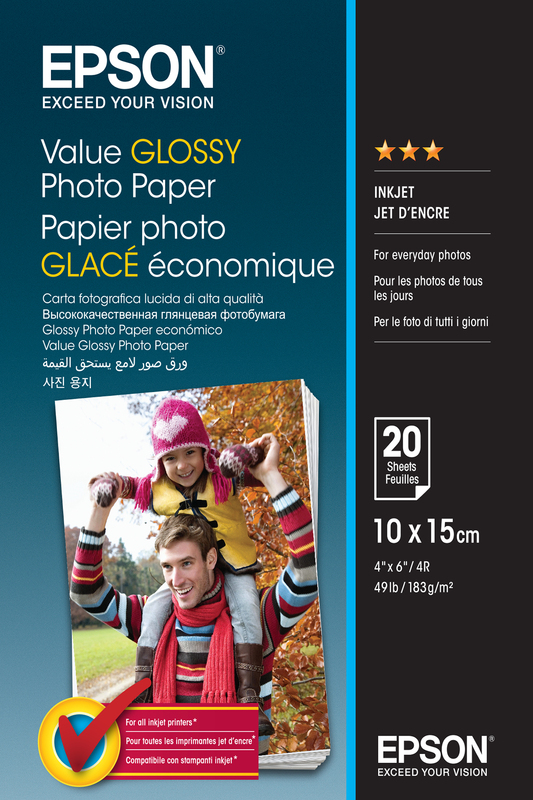 Epson provides a selection of photo papers to ensure there’s the right product at the right price for every situation. The new 183gsm three-star Value Glossy Photo Paper takes pride of place at the entry level of Epson’s range. For those looking for a professional or archival quality, Epson also provides the resin-coated 200gsm four-star Glossy Photo Paper, 255gsm five-star Premium Glossy Photo Paper, and finally the 300gsm five-star-plus Ultra Glossy Photo Paper. Ideal for an array of uses, the Value Glossy Photo Paper comes in two sizes; A4 and 10x15cm, and is available in varying pack sizes; 20, 50 or 100 sheets. The paper comes in a resealable bag, making it easy to keep it safe from moisture and light.